This table is certified by the Forest Stewardship Council (FSC) for being made primarily of wood that was harvested in a sustainable manner from well managed forests. This claim can be verified by independent third party audit under our Smartwood chain of custody certificate #SW-COC-000055. 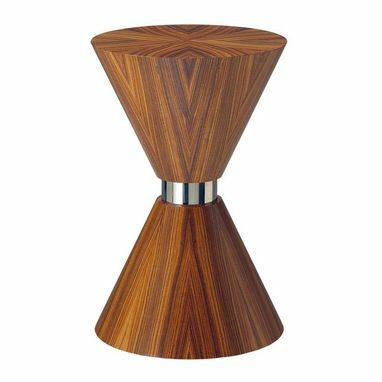 The grain pattern on the top is sunburst, which cascades in a waterfall grain patterns down the tapered cone sides. The center collar is polished stainless steel. The Cuff Link table, as shown, measures 12" dia. x 18-1/2" high. The wood is reclaimed Madero Acero, and the top has been configured into a radiating sunburst design. The wood on the sides has been cut into a cascading waterfall pattern. The collar in the center is polished stainless steel. Inlaid into the underside of the base is a small convex inlay of a wood called Narra, and it carries a special provenance in the world of sustainable forest management. The actual wood used to make this inlay comes from the last remaining board known to exist of the very first wood to be sustainably harvested on the Solomon Islands in the early to mid 1990s. This wood made its way into North America by way of Eco-Timber in California. This table has been individually crafted on a bench by hand, and is dated, numbered and signed. Custom sizes are also readily available. The Cuff Link Table can also be made in other species of woods.